Industry 4.0 is a term that’s been used for years to discuss the fourth industrial revolution. Its implications for Canadian manufacturers are profound; through the integration of digital platforms, companies can optimize their use of technology to drive innovation, productivity, and overall competitiveness. One of the best resources for understanding the implications of Industry 4.0 is PwC Canada’s Industry 4.0: Building the Digital Enterprise report. Although it was originally released in 2016, many of its core insights remain relevant today for companies exploring how they can embrace the trend. Through the report, PwC Canada demonstrates the clear impact that Industry 4.0 will have on revenue, profit, and customer relationships. Also commonly referred to as the “smart factory” or “digital industry,” Industry 4.0 is driven by connected equipment that provides data, and the capability of management to drive change using this data. This article summarizes many of the concepts introduced in PwC’s Industry 4.0 report and provides some next steps that will help Canadian businesses adapt to the new standard, including accessing Canadian government funding programs to offset the costs of manufacturing investments. This gives a basis to establish your digital transformation plans and identifies financial support to drive lasting organization-wide change. What is Industry 4.0 and What Does It Mean for Canadian Manufacturers? While Industry 3.0 generally prioritized the automation of single machines and processes, Industry 4.0 focuses on the complete digitization and integration of all physical assets into digital ecosystems. Seamlessly generating, analysing, and communicating data is the core of Industry 4.0, which networks a range of innovative, advanced technologies to create value. This is also known as the Industrial Internet of Things (IIoT). To create an environment where industrial businesses rely on digital systems, there must first be IT service providers, telecom companies, hardware, software, and Internet players that create enabling products and services. Adding smart sensors and communication devices to equipment and creating new digital products that focus on completely integrated solutions is paramount to driving the digital factory of tomorrow. Industry 4.0 digitizes and integrates processes across the entire organization; this provides better visibility and control over business operations. Spanning from product development to purchasing, manufacturing, logistics, and service, performance data can be accessed and used in real-time to drive improved results. This enables company management and employees to make intelligent decisions that improve productivity, competitiveness, and improve supplier/purchaser relationships. Industrial companies can expand their value proposition by providing customers with disruptive digital solutions such as integrated platforms. Customers are increasingly demanding a streamlined process that optimizes interaction and access; providing services digitally through Industry 4.0 is the best way to achieve these requirements. This inevitably leads to improved customer experiences and stronger relationships. Canadian manufacturers and other businesses who could benefit from adapting to Industry 4.0 operating standards should prioritize digital integration above other strategic projects. Now well into the transition between Industry 3.0 and Industry 4.0, manufacturers who resist joining the Industrial Internet of Things could have difficulty remaining competitive. Map Out Your Industry 4.0 Strategy: Understanding your current level of digital maturity and setting digitization targets will guide the transformation process. Consider any past digitizing activities and how these can be expanded across the organization, or with customers, suppliers, or technology partners. Create Initial Pilot Projects: Starting small is essential for digital transformation. For one, it’s critical to gain buy-in from the entire company. Pilot projects and gradual roll-outs will keep employees and management from becoming overwhelmed with the level of change. Data gathered from Industry 4.0 projects help bring management on-board, which is essential to transition. It will also help secure additional funding once project results can be verified. Define the Capabilities You Need: Having completed an initial pilot project, there should be many learnings that make Industry 4.0 leaders re-consider their plans for digital transformation. At this point, it makes sense to record the types of constraints expected along the way. For most manufacturers and traditional businesses, the ability to recruit employees and develop a digital-focused workforce can be the hardest part. Develop plans for how to overcome these challenges. Become an Expert in Data Analytics: How will data be used within your organization to drive change? Having at least one data analytics expert is a step in the right direction; however, to get the full value out of the digital industry, having cross-functional teams are even better. Data-driven teams can build more intelligent products, processes, and services, making them more competitive. Transform into a Digital Enterprise: Company-wide digital transformation is the most critical element of Industry 4.0. This starts with upper-management and trickles down to all employees. The main goal here is to foster a digital culture where employees think and act like digital natives and are willing to experiment with the integration of emerging technologies. This change doesn’t end; rather, the digital factory embraces continuous change and re-invention as technologies improve. Actively Plan an Ecosystem Approach: The benefits of Industry 4.0 can only be realized completely if organizations envision what it means for how they do business. From customers to suppliers and strategic partners, companies can significantly improve the value they provide. Think of Industry 4.0 as an ecosystem: The more you can share knowledge and be accessible through new platforms, products, and services, the more your business will thrive. Purchasing and integrating Industry 4.0 technologies into your business’ processes is well-aligned to the focus of many Canadian government funding programs. From technology purchases to workforce hiring and training projects, the costs of digital transformation can be directly offset through the support of government grants and repayable funding. Purchasing hardware and software to generate data-driven insights is an area where government funding can support Industry 4.0 projects the most. There are several technology adoption grants available, both federally and provincially, to help Canada’s manufacturers generate value from the Industrial Internet of Things. As mentioned earlier, having complete buy-in from company management and employees is essential to Industry 4.0 success. Purchasing and integrating data systems into your business is only the first step in a project, and does not guarantee success. Ensuring your team can use the equipment and effectively make decisions based on the data it generates is the bigger element which must also be tackled. Workforce development grants can help companies build an Industry 4.0-compatible team by hiring top talent and improving the skillsets of current employees. This is a dynamic approach to ensuring your organization fully supports and drives value from the Industrial Internet of Things. 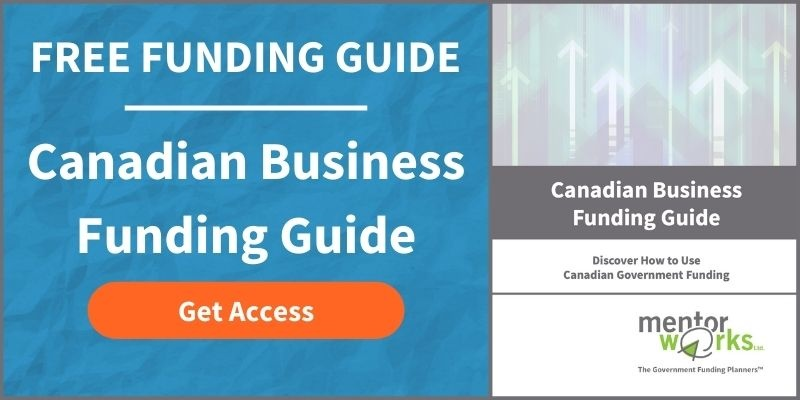 Learn more about the core elements of government funding programs, including types of funding and how to access it, by downloading the Canadian Small Business Funding Guide. Posted: June 11, 2018 by Jeff Shepherd. Updated: June 11, 2018 by Jeff Shepherd.